There are a total of nine battle pets that can be gained from killing rares when the Horde has control over the Arathi Highlands. Each of the following rares give you one chance per event cycle, to acquire a unique Battle Pet. 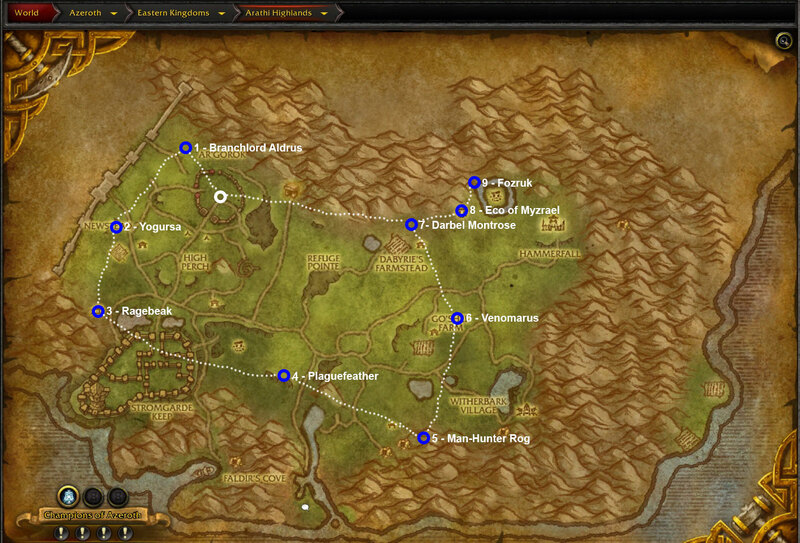 For our Alliance readers we have also made an Alliance farming map for your convenience. When you come across this lumbering vengeful treant, it is beast to stay out of rang of his slamming attacks, and to watch that you don’t get caught up in his roots. When defeated, the accident guardian may gift you with an Elemental Battle Pet: Aldrusian Sproutling. This is one angry moonkin that will call down the very stars to kill you. When defeated she may lay an Angry Egg, that hatches into a Beast Battle Pet: Ragepeep. This poor diseased beast is covered in scars, scabs and puss filled sores, and has a unavoidable charge. When defeated you might find her equally disease ridden cub hiding near by. This poor thing can be used as a Beast Battle Pet: Scabby. Found flying around a tree a top a hill. When you defeat this bird, it has a chance to drop a Plague Egg, which unlocks the flying Battle Pet: Foulfeather. Accompanied by his pet bird, Rog patrols up and down the mountain. He spawns in at his base camp but can also be found at the base of the path leading up to his encampment. When you defeat this Oger, he has a chance of dropping a Mana-Warped Egg, which unlocks the Flying Battle Pet: Squawkling. This giant spider can be found wandering around the open hillside. When you defeat it, there is a chance you will receive a Beast Battle Pet: Fuzzy Creepling. This young warlock can be found inside her house atop a hill. When you defeat her, she may drop her Tiny Grimoire, which releases a Magic Battle Pet: Voidwiggler. Surrounded by elemental spirits, this Giant Statue can be fund at the center of some collapsed ruins. She has a fear inducing gaze that could send you running if you looked her in the eyes. When defeated she may drop a Magic Battle Pet: Teeny Titan Orb. This mountainous stone golem is said to be found in multiple locations. We our selves have only ever encountered it on the northern side of the map, slightly to the east of central north. When defeated, it may drop you a Shard of Fozruk, which becomes an Elemental Battle Pet: Fozling.